Cut two 11" pieces of #26 red wire. ____L1,2: Wind 14 turns of #26 red wire on the T37-2 red toroid, tightly spaced. ____T4: Wind 32 turns of #30 red wire on an T37-2 red toroid, tightly spaced. 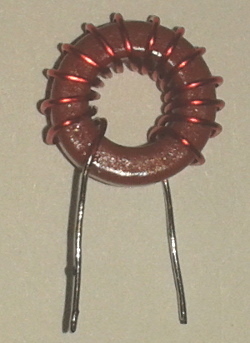 ____T2: Wind 32 turns of #30 red wire on an T37-2 red toroid, tightly spaced. Trim the #30 wires of T2 to one inch. Wind 2 turns of #27 green wire on the T37-2 red toroid, tightly spaced. Trim the #27 wires of T2 to a half inch each. Cut 17" of #30 red wire and 4 inches of #27 green wire. 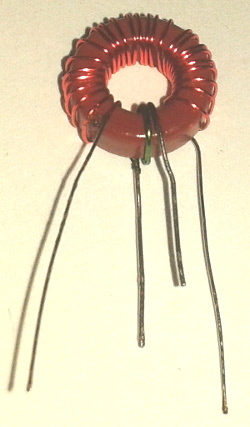 ____T3: Wind 25 turns of #30 red wire on an T37-2 red toroid, tightly spaced. Trim the #27 wires of T3 to a half inch each. 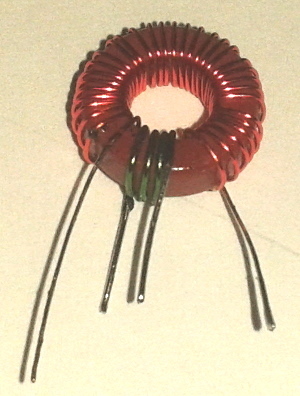 ____L3: Wind 17 turns of #26 red wire on an FT37-61 black ferrite toroid, tightly spaced. Cut 16" of #30 red wire. ____L6: Wind 24 turns of #30 red wire on an T37-2 red toroid, tightly spaced. Cut 21" of #30 red wire. ____L5: Wind 33 turns of #30 red wire on an T37-2 red toroid, tightly spaced. There are 5 pieces of 12.000 mHz crystals included in the kit. Next we will adjust for maximum carrier output. 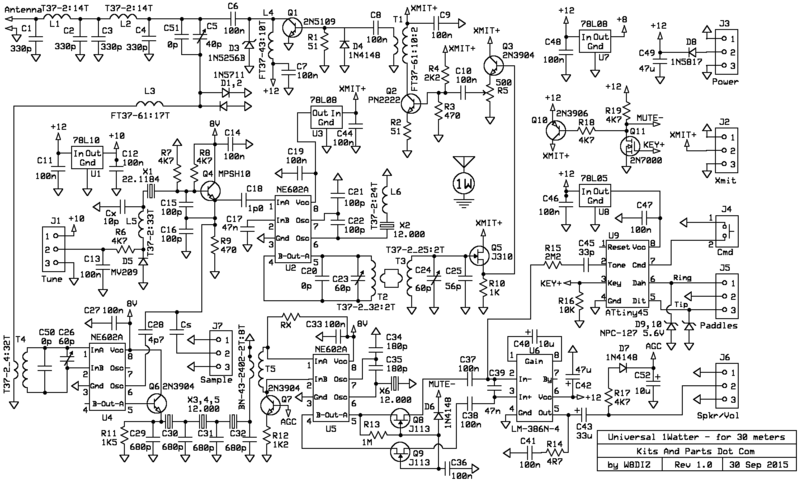 You will need a 30 meter receiver or an oscilloscope. 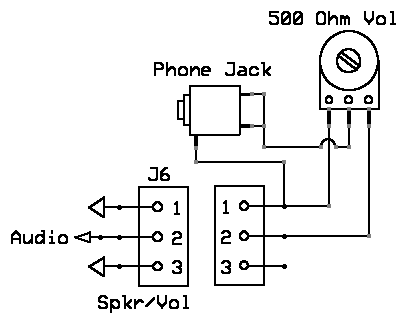 key the transmitter and adjust C24 to max signal on the scope or receiver. 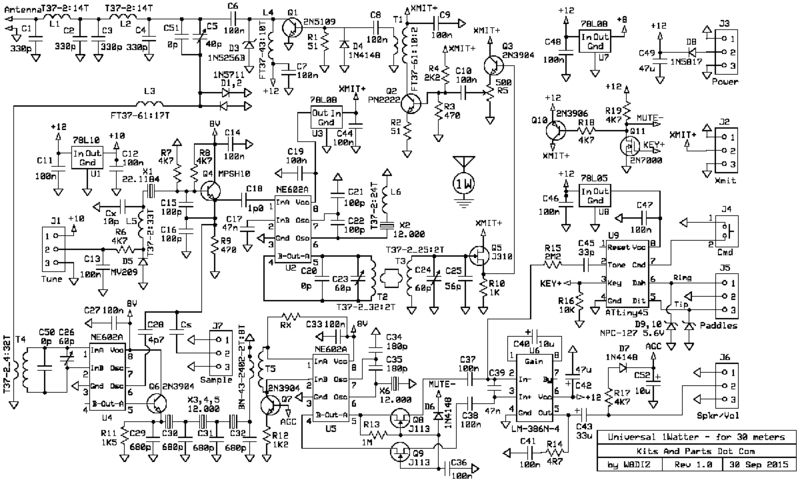 and C24 should be near 60 percent capacitance. 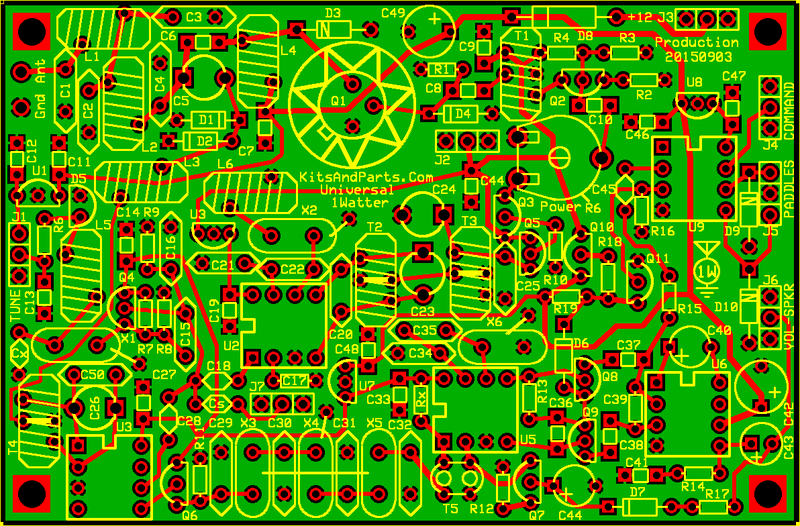 and C24 should be very near 60 percent capacitance. Add capacitance at Cx, between the crystal X1 and L5 and ground. Try 10-15 pF for starters. prevent audio oscillations at very high volume. Google search "Boucherot cell"